WOW!!!! What a chase day! We started in OKC with an initial target of Dalhart, TX. Though our eyes were occasionally drawn to the great conditions up in Colorado, we stayed with our target area and waited in Dalhart. Finally, around 5 o'clock, the old Panhandle Magic kicked in full bore. A blip on radar developed just southwest of town, and we quickly decided to go after it. 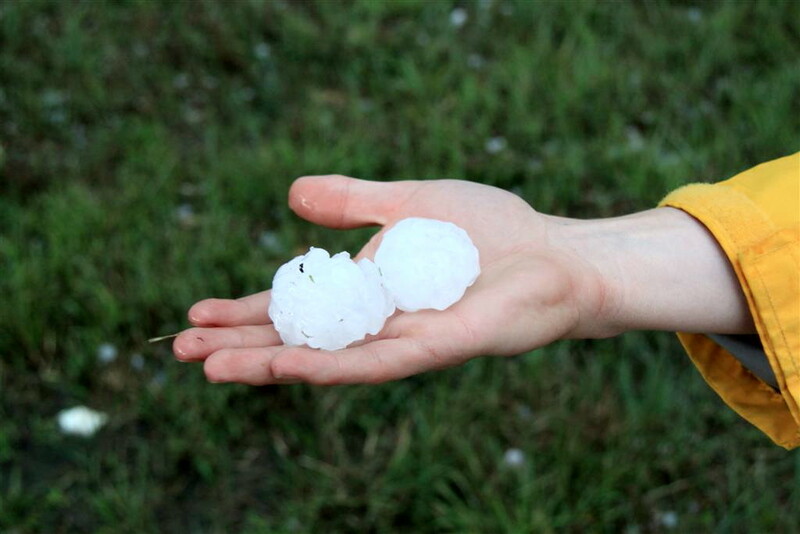 In a very short period of time, the storm went severe and started dropping big hail. 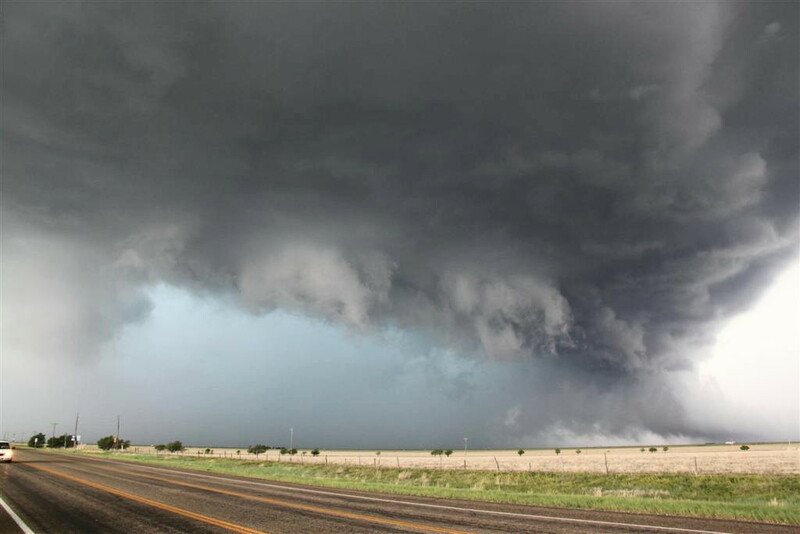 We got to it just west of Hartley, TX, where the storm quickly produced a low hanging wall cloud just to our west. 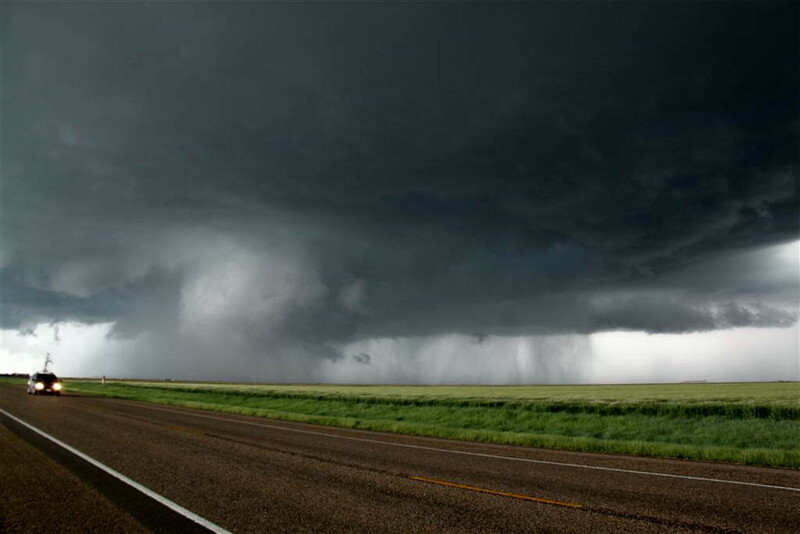 After watching for a while, we nosed back north, getting banged around by golf-ball hail and driving past fields loaded with recently fallen hail. Meanwhile a second cell had formed and we found ourselves needing to blow through the gap between the two despite the hail. As we made is about 1/2 way through, it appeared the southern cell was going to drop a big wedge tornado just south of our position! We managed to get through the cores and ended up in a chaser's dream scenario. The two cells merged into a monster supercell that more or less traveled on and easterly course just north of our east-west road for the next several hours. We stayed ahead of the storm, stopping every few minutes and watching until the hail core caught up with us. 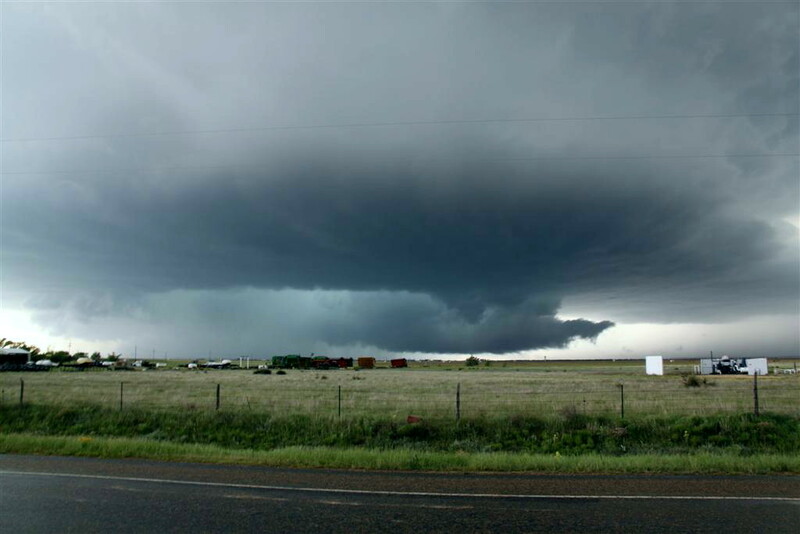 Meanwhile, the storm had developed FANTANSTIC structure and cycled wall cloud after wall cloud. In between Hartley and Dumas, after forming several funnels, the storm finally dropped a very brief elephant trunk tornado. 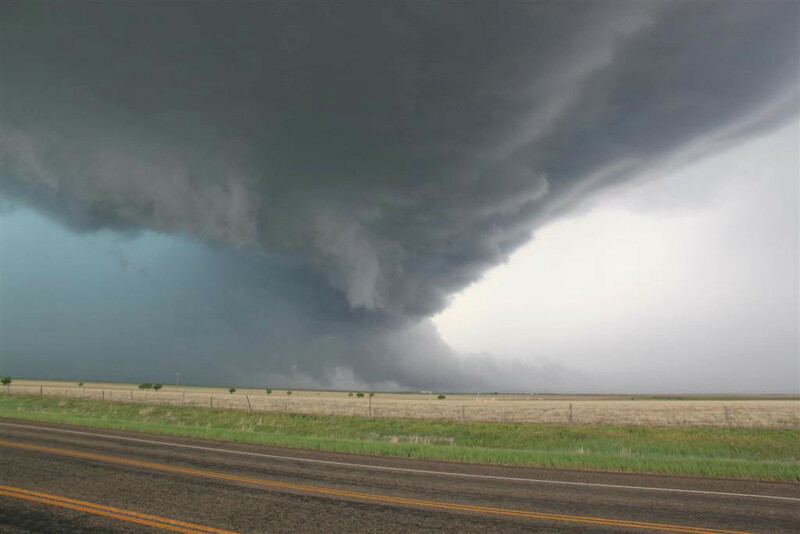 As we continued to stop and go to the east, the inflow became awesome, howling towards the storm at 50-60 MPH at times and remaining active for just about the rest of the chase. Meanwhile, the storm had a massive vault area and the hail roar was plainly audible and the core glowed green with hail. After we moved east of Dumas, the storm produced a second, this time cone shaped, tornado partially wrapped in rain, and then simultaneously produced a second elephant trunk to the north (which I sadly did not see). The cone lasted for a minute or two before it dissipated. 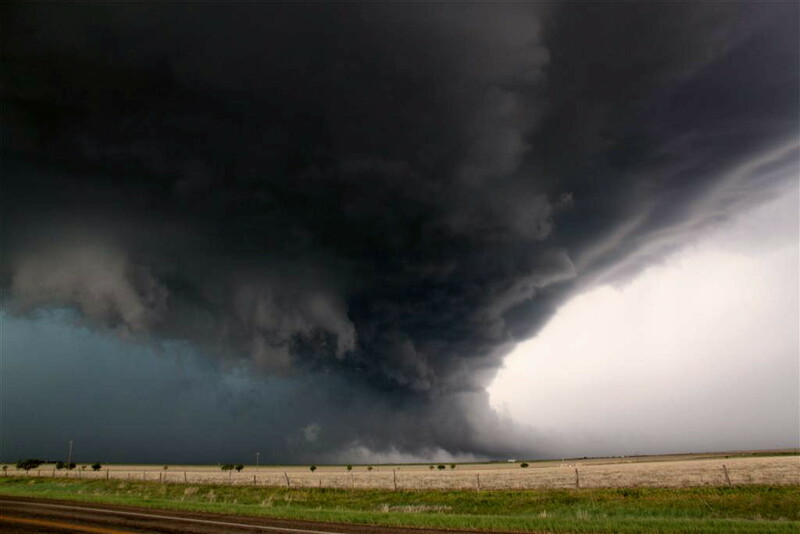 In the next cycle, the storm formed a big block wall cloud just across the field from us and looked ready to drop a big tube right in front of us, but somehow did not. Finally it looked like our chase was coming to an end as we were nearing Stinnett, TX and with Lake Meredith to the town’s east it looked like we were out of roads. 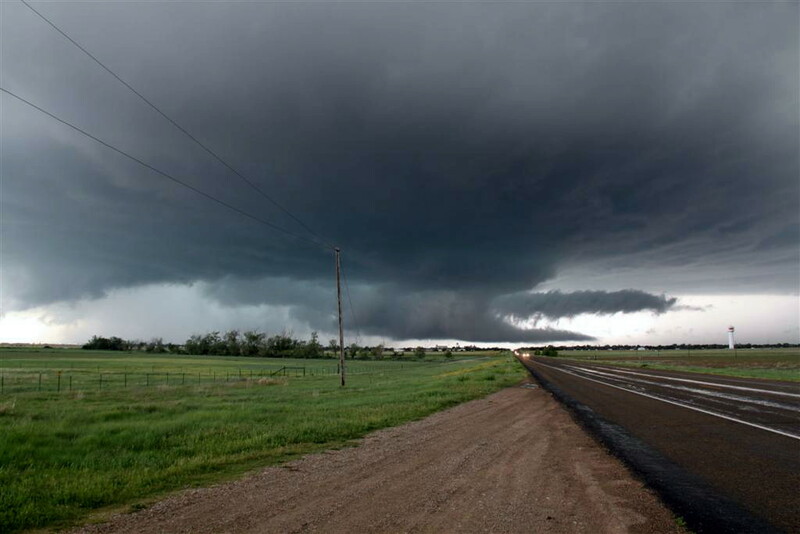 We decided we'd head to the north side of town to watch the still amazing structure as it went by us and off into the river valley, when the town’s tornado sirens started blaring. 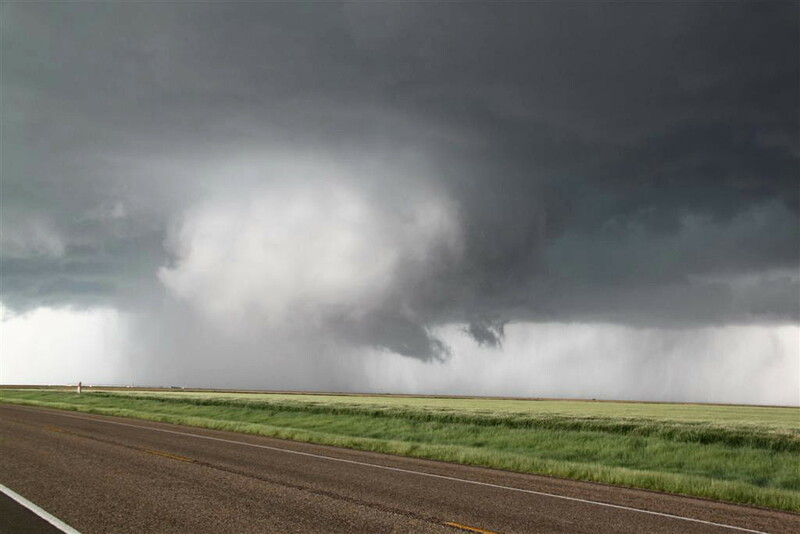 Then, as we came over a rise and got a clear view, the storm dropped a big stove pipe / cone tornado right on the front of the storm's mesocyclone! We then proceeded to drive up and down the north road into little notches between big cores and the storm continued to produce funnel after funnel almost right on top of us. 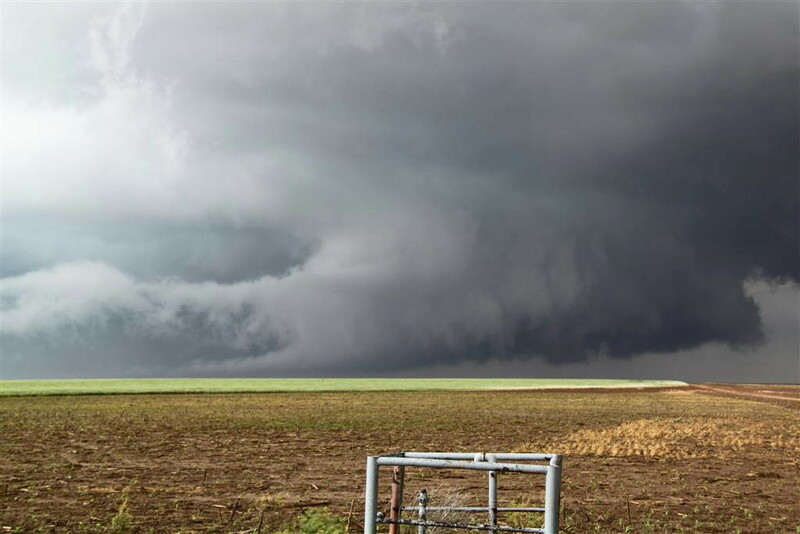 When the largest core went by it was an awesome sight with a massive hail shaft moving slowly across the field just east of us, and the tail end mesocyclone spitting out funnel after funnel to our west. Eventually, with darkness falling we decided to call it a day and head to the hotel which conveniently was less than 60 miles away. Mileage for the day was 513 miles. We head out on the farm roads west of Hartley, TX. First wall cloud of the tour quickly forms. 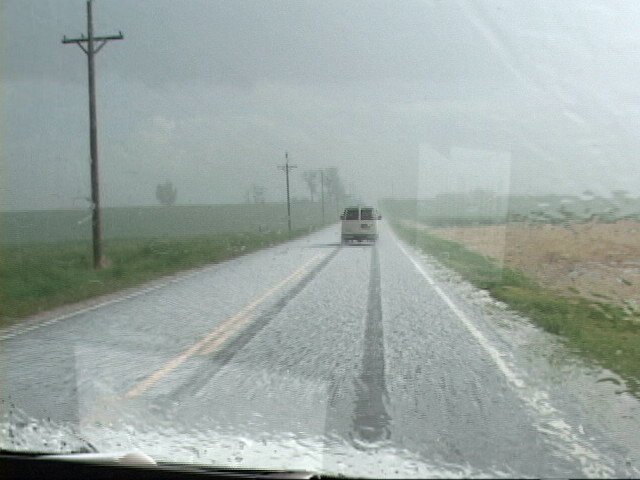 Heading through hail covered fields just after the hail core passed. We had to cut between this storm's core and another coming up from the south to stay ahead of it. Now east of the storm and in good chase position, we watch a second wall cloud hanging low to the ground. 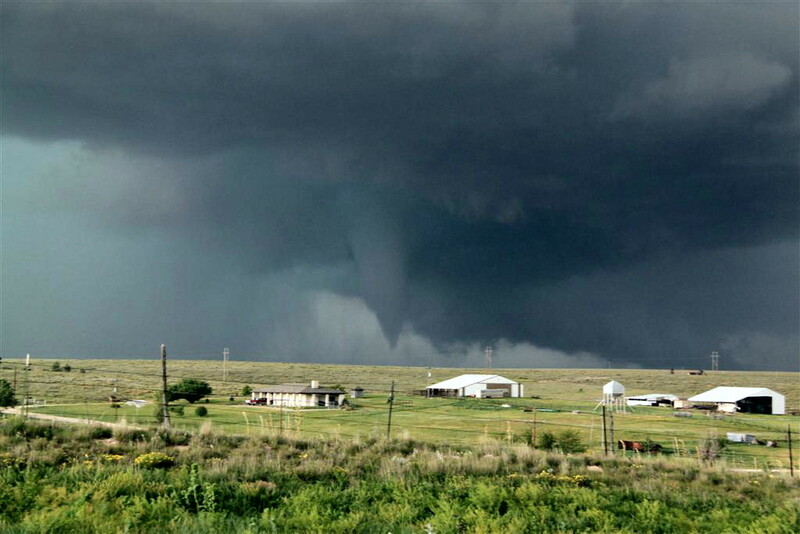 First funnel cloud of the tour in the foreground, big precipitation core behind. 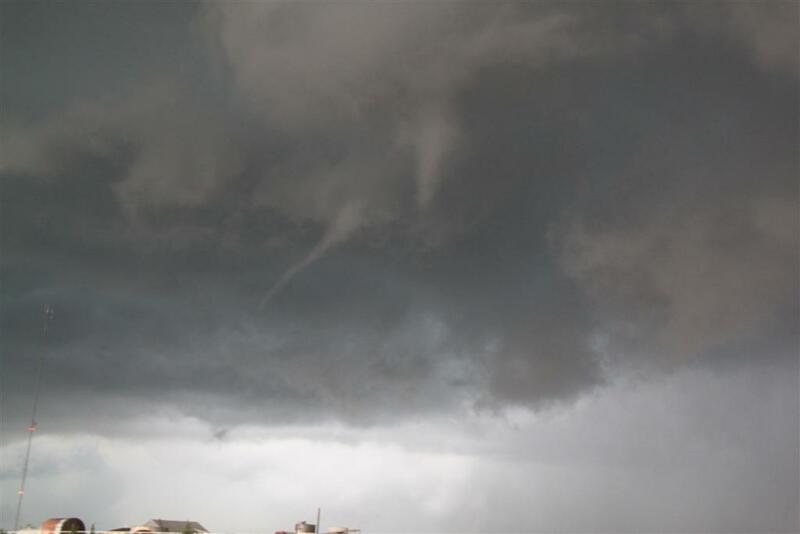 Closer look at the funnel. 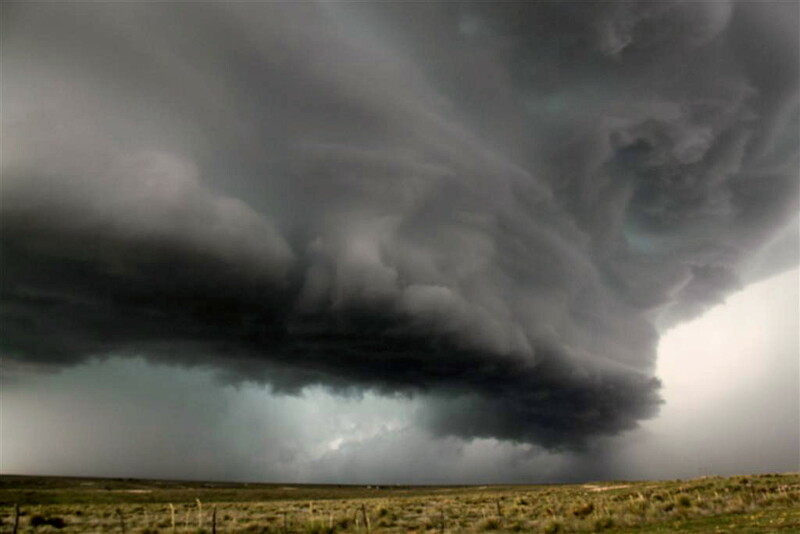 This storm had INCREDIBLE structure! 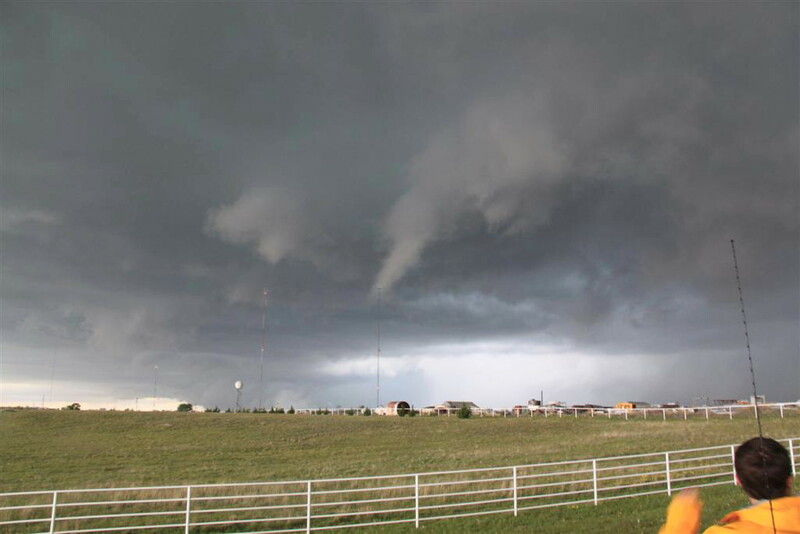 Note the large inflow (or beaver tail) band flowing in from the northeast, milky precipitation core behind that, and the vault area above the inflow tail, while the nearly rain-free updraft area is to the left side of the picture with the funnel cloud in the foreground of the updraft area. 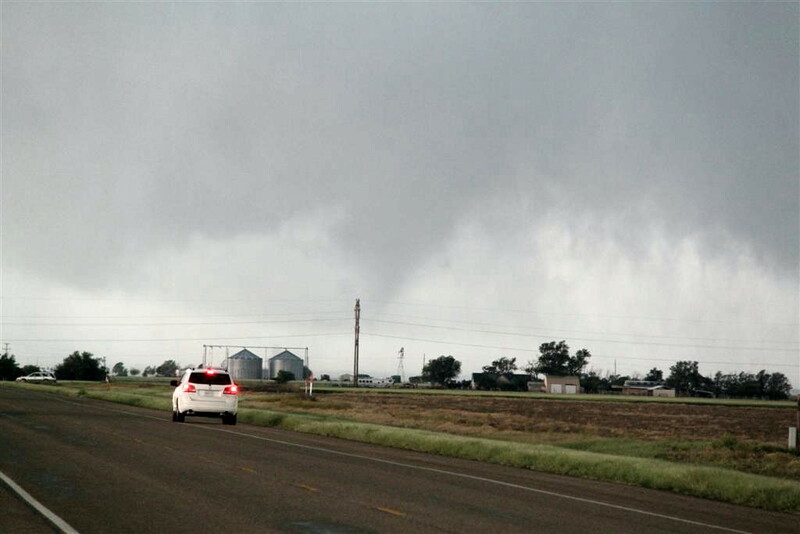 Now east of Dumas, TX, the second of the tornado of the day forms, a partially rain-wrapped cone tornado. An eerie view of the vault area of the storm with tons of hail falling out of it to our north. Lightning in the vault area. Meanwhile a rapidly rotating wall cloud approaches just northwest of our position. When I went back and looked at the video of this I couldn't believe how hard it was spinning. It didn't produce a tornado though. 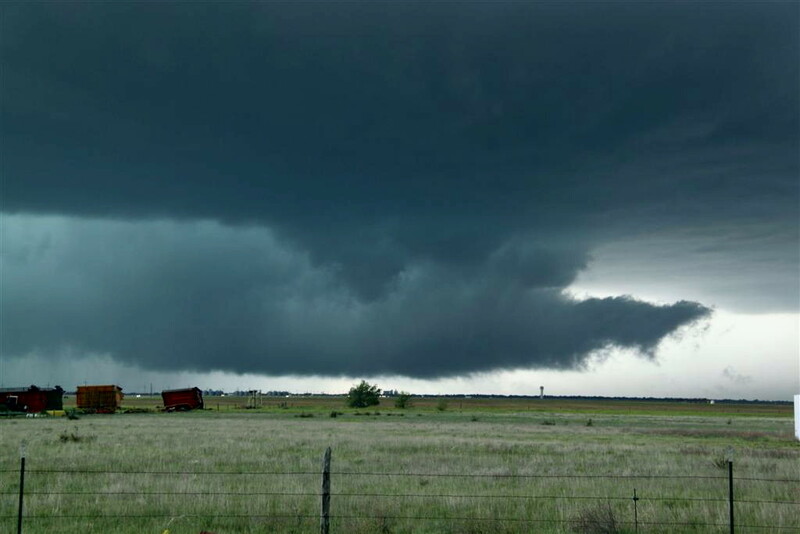 This wall cloud couldn't have been more than 1/2 a mile from us, spinning like crazy. The storm became an HP monster!! The next few pictures show the awesome "whale's mouth" of an HP storm. Note again the greenish glow of the hail in that big core. Go in there and expect a serious whuppin'! Getting closer. Note the inflow band to the northeast practically on the ground. 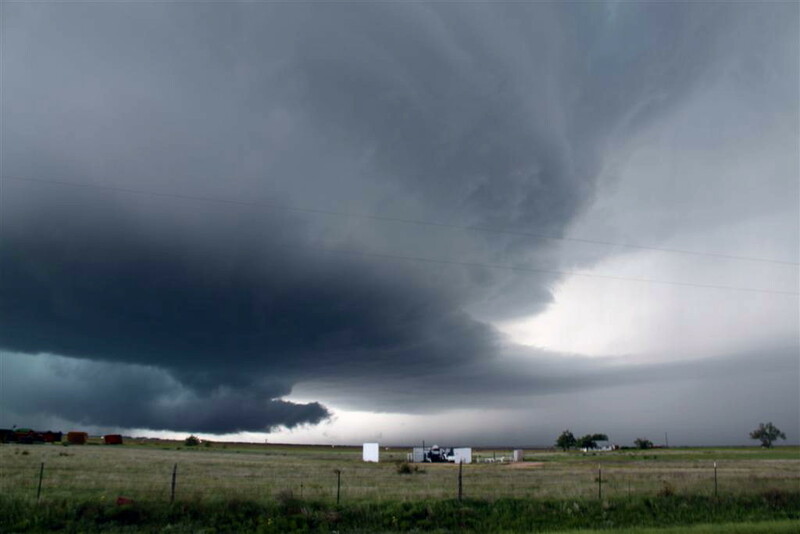 This storm consistently had 50-60 mph inflow winds blasting towards the storm. Better look at the inflow band. Awesome looking roiling of the clouds above the shelf cloud. Surprise! We were running out of roads as we got to Stinnett, TX, and the storm had become an HP hail machine. 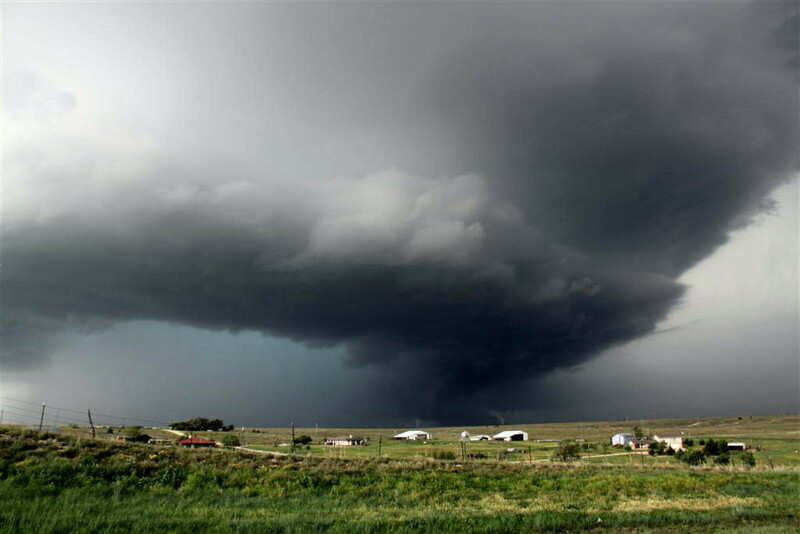 We headed north out of town to get one more look at the storm before it headed away from us and as we topped a hill were greeted by this big stove pipe / cone tornado formed right on the leading edge of the mesocyclone. Closer look. 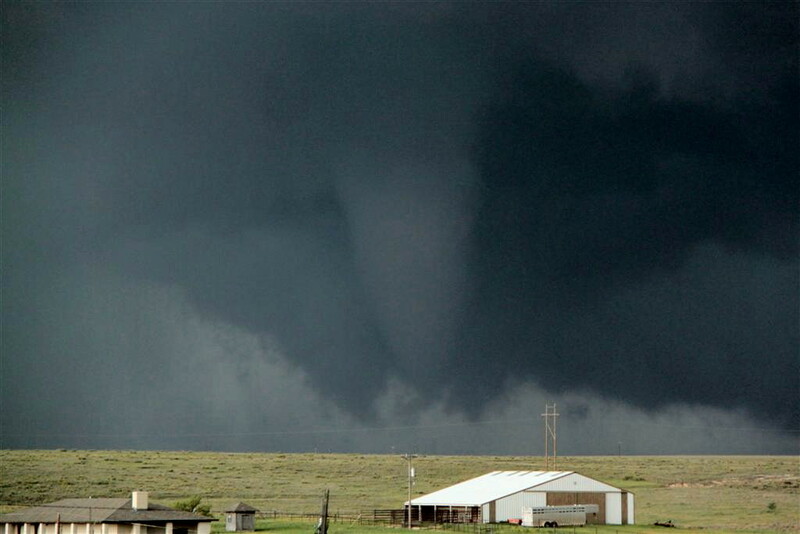 The tornado moves off, wide shot to include more of the structure. As the shelf cloud approaches us north of Stinnett, numerous funnels formed very near our position. 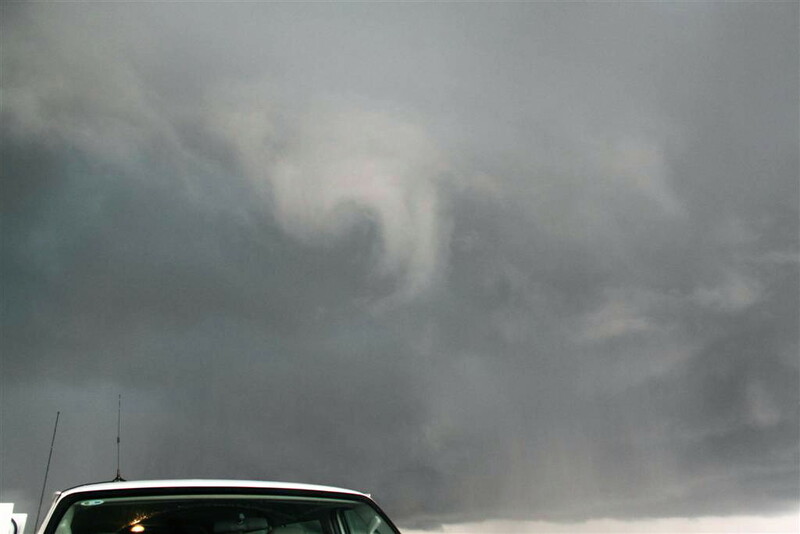 Two funnels at once almost right over the van. 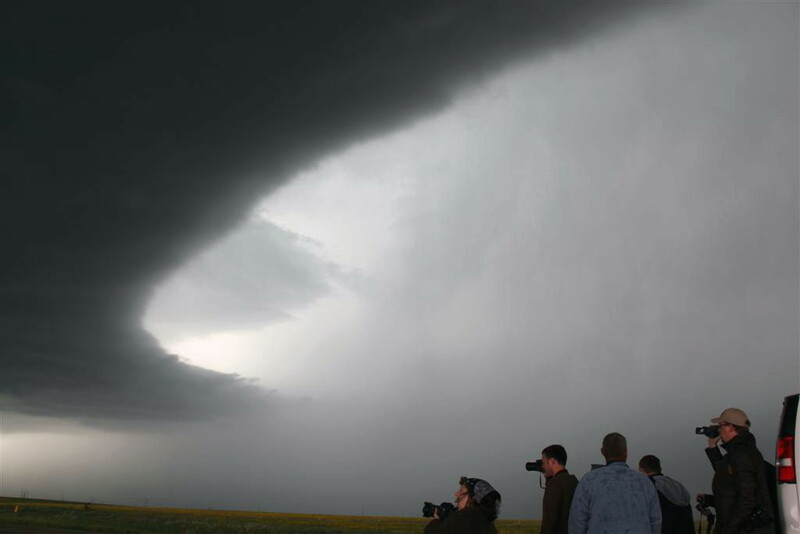 And this one literally WAS right over the van... After the first core passed, we stopped to collect big hail. 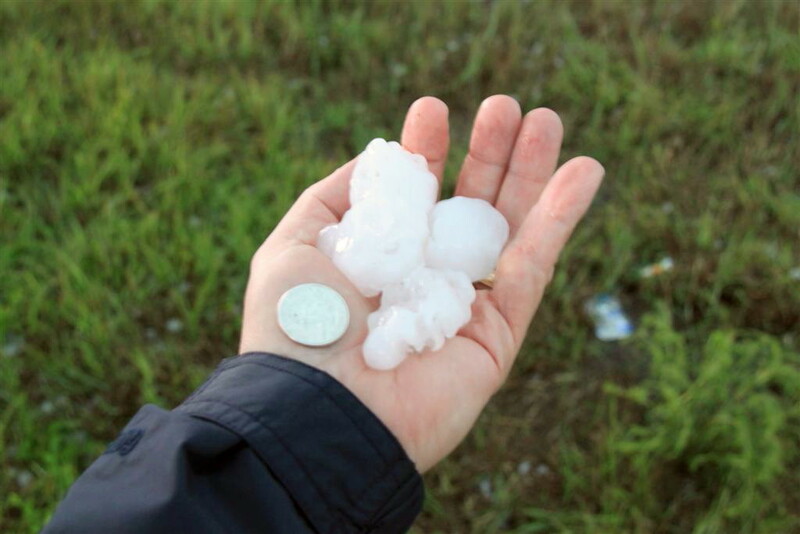 More hail with a quarter added for reference.